Most everyone does a Christmas countdown, but I don’t know a single person who does one for Tax Day. We might as well do it since there is no escaping paying taxes – unless you want a visit from the IRS. So, 32 days till that wondrous day: April 18. However, this is not the only date (and other tax-related details) we have to remember. If you’ve been a freelance writer for many years, then you know you can’t relax when it comes to taxes. You’ll have to take note of the due dates for federal taxes, state taxes, and so on. 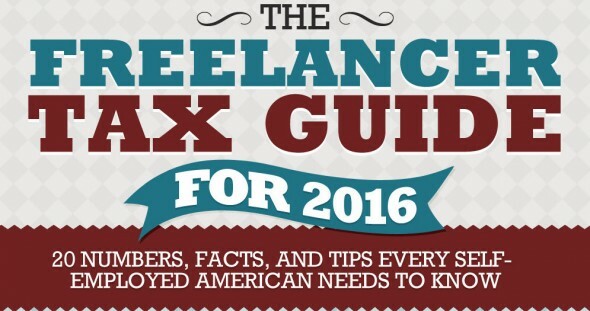 If you’re new to this, then you’ll want to have a good grasp of handling freelance taxes. You can always hire an accountant to do the work for you, but if you want to save money, then it’s better to handle your freelance taxes. It may be complicated but it’s not impossible to do it on your own. This freelance tax guide 2016 infographic is a handy reference which self-employed individuals will want to print and put up on their walls. It starts on a not-so-positive note, which may turn you off, but I believe it’s a good way to keep you grounded. Freelancing is great, but the reality is that we still have to pay taxes – and there are some disadvantages to freelancing when it comes to that. This infographic provides dates, information on “other” taxes, and tips to ensure you make the most of your tax perks, as well as other financial tips. Do you have any tax tips?